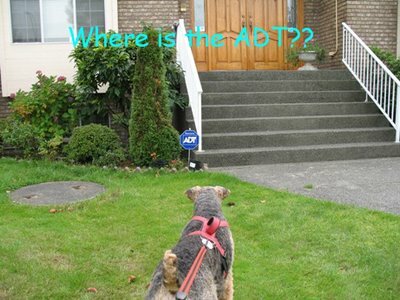 Life of Miss Sunshade - The Vancouver SuperDALE: ADT but no ADTs?? 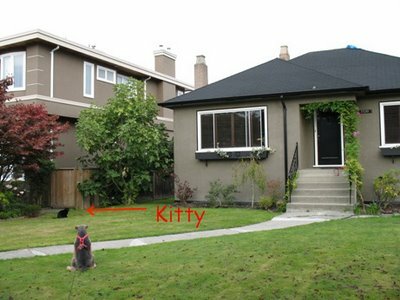 I don't think people in my neighbourhood are in their right minds. 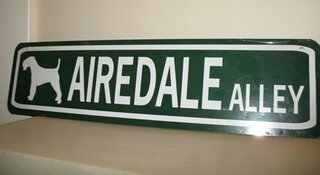 I keep seeing this sign outside people's houses...., and I have been paying special attention to those houses everyday. 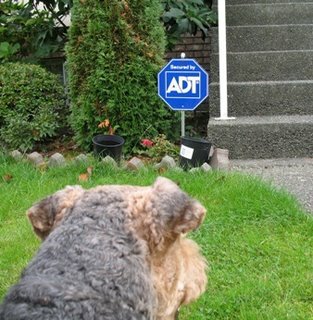 I mean, just look at them, do you see anything that might suggest an Airedale actually lives in one of these houses?? Obviously, no ADT lives in this house since the newspaper is still intacted, not shredded!! 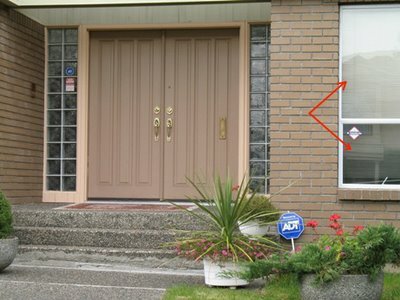 And this one, the blinds are down and still intacted, no nose marks on the window, hence, no ADT! Now this one is just a given, no brown spots or huge holes on the lawn, the garden is actually growing flowers and not dug up!! 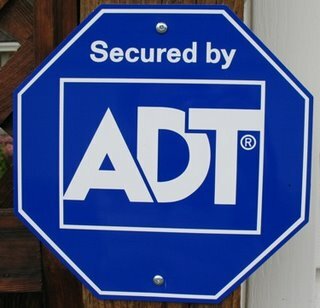 So why do people say they are secured by ADT when they don't actually have ADTs?? Then we have another group of irresponsible people who obviously have some serious guarding animals, and yet, they put no warning signs to warn the unawared parties. 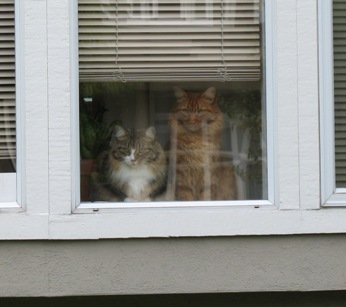 Look at these guys, their synchronized gaze is powerful enough to give any intruder a heart attack!! YET, no warning signs! You definitely don't want to mess with this guy because he is easily gonna come through that glass!! NO warning signs! I can attest to it!! 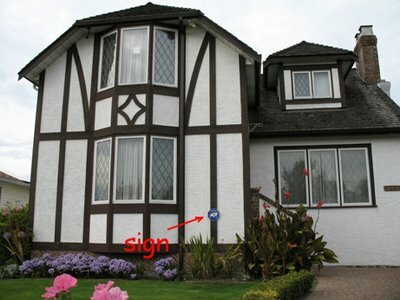 Lastly, there is one house that not only does not have a serious guarding animal, they don't even have a sign that looks serious!! What is THIS suppose to do exactly?? And I make sure I give sufficient warnings!! 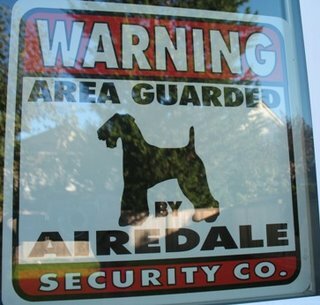 errr... are those airedale security for hired for a shih tzu house too? mom wants one too! 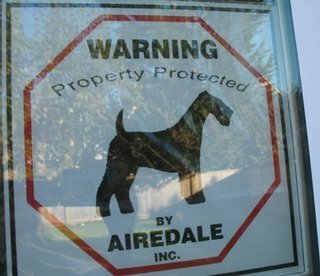 Hmmmmm, we have one of those signs, but it means "Awesome Dog inspiring Terror." And afterall, who would be stupid enough to break into my house? 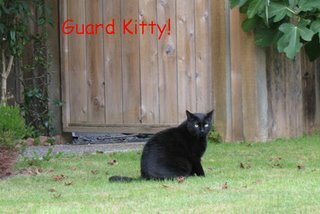 We have one of those roaming guard kitties in my neighborhood. 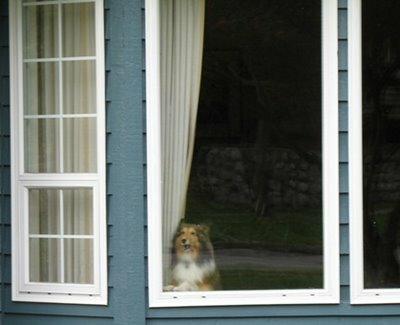 Chani watches it all the time from the window. I think she thinks it's a criminal kitty and not a guard kitty. She's waiting to catch it with the loot !!! You make your property look so scary! 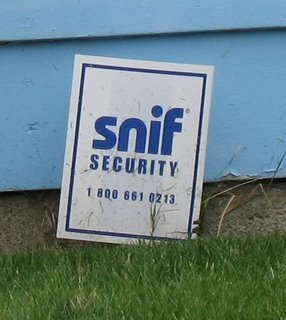 I'm sure you've scared away dozens of intruders. My mom says I'm a dangerous poodle because I growl when I play with my toys. But she has never seen me attack or growl at a person. I think CC-man is much more dangerous. Wow Sunshade, you have alot of signs to warn people. And they are beautiful signs! Hey! 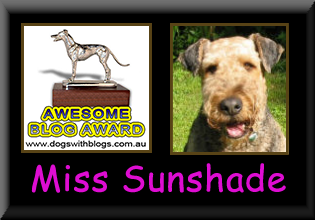 Miss Sunshade, you are my type of gal! I am lovin your Blog, you seem very similar in your good habits to me, Marvin The Dog. In answer to your question to me about being allowed on the beach here in Scotland - us Dogs are allowed on beaches in certain areas. Most beaches here have a Dog Beach (which is the best beach of course!) and a People Beach (which is a fairly boring beach in my view). but yes, those ferocious felines ought not to be allowed! 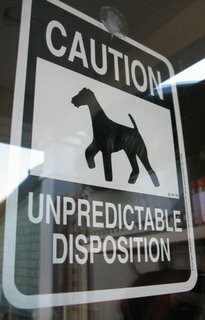 I found those signs on here (http://www.petpro.com/sharedfiles/animallistfiles/dogbreeds/dogbreedskickoff.html). You can click on your breed, and then click "Signs" icon on your right hand side, and you will see all the signs there are! 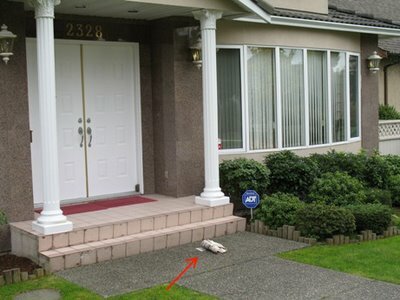 We have signs all over the house saying BEWARE OF DOG. Little do people know it's a LICKING warning. I would just lick em to death.